Colocation data center Macminicolo has already gotten its hands on the new Mac mini, putting all three stock models through benchmarking tests and sharing initial impressions of the machines. - Don’t look now, but the new Mac minis are getting comparable to the last gen Xserve and 2010 Mac Pros as far as benchmarks. Tech progress marches on. - All Mac minis now come standard with 4GB of RAM. Thank goodness. 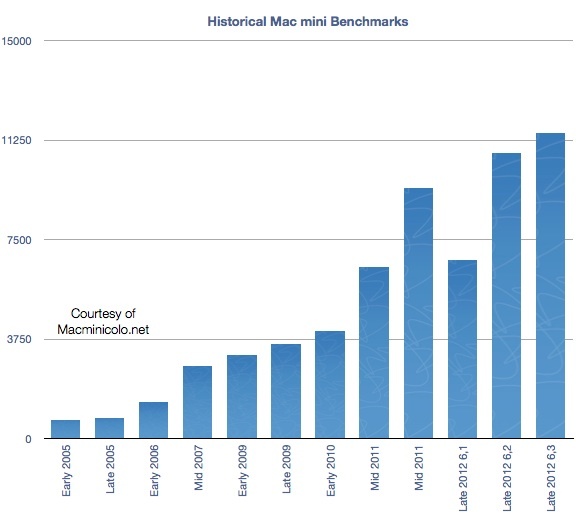 As of last week, the base Mac mini had 2GB of RAM and that was brutal with Mountain Lion. - The Mac mini can officially be upgraded to 16GB now. It’s been possible for over a year, but it had to be done after ordering. Now, Apple offers the 16GB of RAM. - The base mini is still i5, but the middle and high end minis are quad core i7 Ivy Bridge processors. That middle mini is the most interesting. Many customers prefer the quad core for things like an Xcode build server or for plenty of cores to spread between virtual machines. That $799 Mac mini is going to be very popular. - The machines now come with 1600MHz DDR3 Memory. Seriously, 16GB of 1600MHz RAM in such a small machine. It’s really quite amazing. 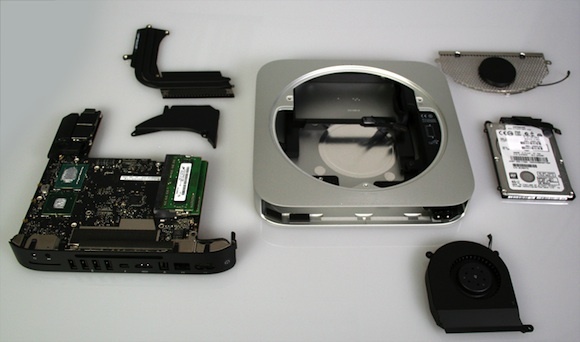 Another colocation center, Mac Mini Vault, has also taken a look at the new Mac mini, noting that their machine arrived running a custom Build 12B2080 of OS X 10.8.1. The company also performed a quick teardown of the machine, noting that Apple has tweaked the fan design since last year's model and also made some changes to the wireless antennas. They forgot the GPU benchmark. Don't insult us with Xserves and say that the two are comparable. Does the new Mac Mini support ethernet bonding? oh wait, it only has one ethernet port. But the Mac Mini has a thunderbolt port which you can add at least another ethernet "port" with. Scores are good. Imagine the increase if the case was...dare I say...a little bigger and fatter, with the ability to have a nice GPU as well as a desktop CPU. Wait I said bigger? WHOA Johnny Five Ive don't pass out. Mini is a good machine though not knocking it really, it could be so much more. I think for the prices apple charge for their macs, a ssd should come as standard across the board. I think it is a little silly to be so amazed over 8 GB SO-DIMMs. You were 'insulted' by a tech review? It was a helpful comparison to give a rough estimate of how far the mini has come. I found it useful and not once did I think "Ha ha, Macrumors sure stuck it to MacintoshMan!" I'd say that's three ways (two fairly cheap) to get two GB Ethernet ports on the Mac Mini wouldn't you?